I wasn't quite sure how I was going to like this story going into it. The only other Quaker character I've read about was a secondary character in another series and the "Thee" and "Thy" were a bit much to get through, but the description of this story sounded really good. Boy, I'm so glad I went ahead and read this book! The setting of this story is unique. In many historical fictions settings, you see during the Civil War, right after the Civil War, the Revolutionary War, but not a few years before the Civil War. There is a lull it seems in that build up period. Lyn was able to bring the tension that is building on both sides of the Mason/Dixon as a powerful background for our characters. And what I loved about how the tension is on display is that historically speaking, not everyone in the South was happy with slavery and not everyone in the North was happy to help abolish the act or put their neck out to help. It is through Honor, we are able to follow her from the South to the North and witness both sides of these thoughts. Plus, we are able to see what a hard time it was on either side of the line to be a woman...especially one that spoke her mind with such force and wit as Honor did. Another aspect of Honor that I enjoyed seeing was that of a lead character who is deaf. Samuel is a man who hasn't heard anything or said anything since he was child. His only form of communication is through sign language that his mother sought out and learned and taught him. He has not had any thought of marriage or of family in his adult life. He only cared about taking care of his mother and his nephew, who was left orphaned, but when Honor shows up destitute on his door and illness haunting his mother, he isn't left with many options. Honor willing learns sign language and does her best to help Samuel where she can. It is there through their partnership you see things start out and grow in both of them. Honor and Samuel are both fully flushed out characters and their emotions, thoughts, and actions bring so much to the story, and it doesn't stop there. The secondary characters add so much as well and add a further depth and emotion to the story that pulls you further along and allows for Honor and Samuel to grow or express more through them. I enjoyed this story immensely! I'm so glad it is the first in the series, more books to come...yay! The writing and the research of this story really pull you in and make it hard to set this book down. 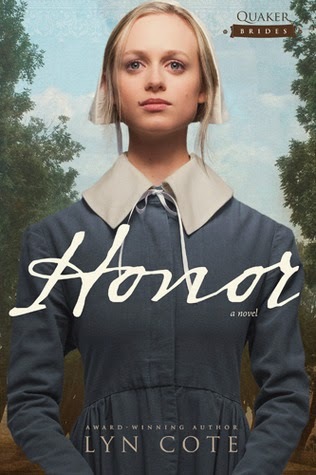 Honor is a wonderfully intelligent character that has a very caring heart, despite some betrayals. Samuel is a broken person in several ways and has a road to travel to trust people again. Both have things that need healing and it is an interesting road they travel on. Lyn Cote, known for her "Strong Women, Brave Stories," is the award-winning, critically-acclaimed author of more than 35 novels. Her books have been RITA Award finalists and Holt Medallion and Carol Award winners. Lyn received her bachelor's degree in education and her master's degree in American history from Western Illinois University. She and her husband have two grown children and live on a small but beautiful lake in northern Wisconsin. Visit her online at www.LynCote.com. Thank you to the Tyndale Blog Network, I received a copy of this book for free in exchange for an honest review. Thanks for a very thorough review and the kind words.